My name is J. Austin Eyer, and I am a Broadway Actor turned Professor at Penn State University. Of the six shows I have performed in on Broadway, I have been a Swing in half of them. “What is a Swing?” you may ask. A Swing is a cover or understudy for the ensemble in a Musical–they step in to play a role when an actor is out sick, injured, or on vacation. Any musical with an ensemble is required to have at least one male and one female Swing. Broadway isn’t the only place you will find Swings. There are Swings for National Tours, shows in Vegas, as well as overseas in the UK, Germany, and Australia. Like most people, when I was cast as a Swing for the first time, I had no idea what to do. There were no courses or resources available to give me an idea of what the life of a Swing would be like. How would I keep up with learning ten different parts in four weeks? How would I deal with the emotional roller coaster of not performing every night and then suddenly being thrown on in the middle of a show? As I went through the Swing “trial by fire” I realized there should be some sort of guide for actors who have been cast as a Swing for the first time. Thus, with the help of my writing partner Lyndy Franklin Smith, the book Broadway Swings: Covering the Ensemble in Musical Theatre was born. 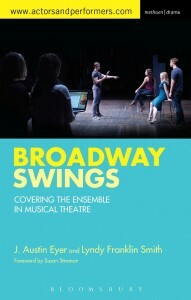 Broadway Swings is a comprehensive guide on how to be a Swing in musical theatre. This position is examined from every angle, showing just how vital Swings are to the success of any musical theatre production. Lyndy Franklin Smith and I drew on our own experiences as performers and gathered first-hand stories from other Swings about the glories and hardships of this job. The book features interviews with over 100 Broadway pros, Swing veterans, Stage Managers, Casting Directors, Choreographers, and Directors, including Rob Ashford, Susan Stroman, Jerry Mitchell, Larry Fuller, Tony Stevens, Beverley Randolph, and Frank DiLella. This book would of course appeal to any young artist who wishes to work on Broadway. But another goal of ours was to give the reader a broad understanding of the life of a Swing from first rehearsal to closing night. Broadway Swings is a must-read for any student, actor, or professor who needs to understand the inner workings of long running shows.